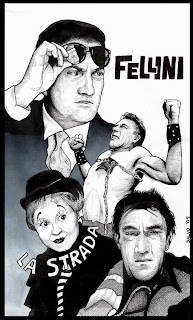 These are some of the main characters from a 1954 Italian movie called La Strada. I copied them out of the free booklet that came with the dvd. At first, I was just going to do a simple sketch of Zampano doing his rubbish circus act but I ended up making it more of a poster type thing with the other characters too.